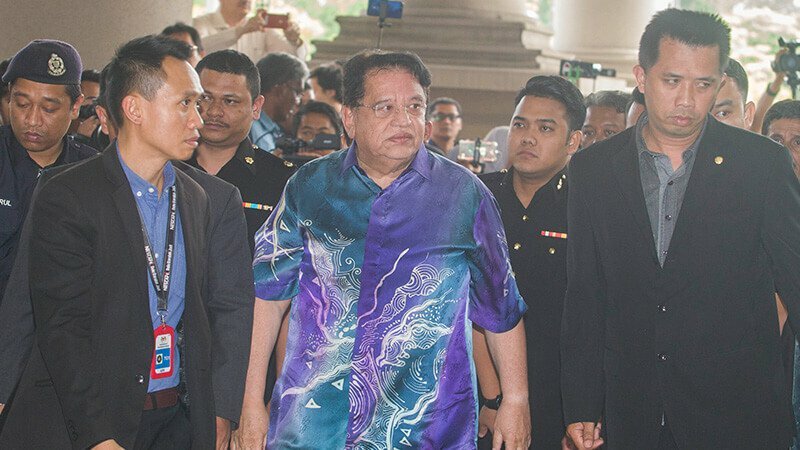 Judge Mohd Nazlan Mohd Ghazali, in dismissing the application, upheld the decision of the Sessions Court in imposing bail of RM500,000 on Tengku Adnan, 69, and for him to surrender his passport to the court pending the disposal of his case. In his decision, Mohd Nazlan said the Putrajaya Member of Parliament, who was in court and accompanied by his four children today, could apply for temporary return of the passport if he had to travel overseas. “The bail of RM500,000 and additional condition to surrender his passport to the court is upheld,” he said when the case came up for mention for the first time at the court since its transfer from the Sessions Court. Earlier, lawyer Datuk Tan Hock Chuan, representing Tengku Adnan, when submitting the application said his client had to travel often to Australia to visit his daughters, aged 13 and 18, who were studying there, and also to Indonesia for business. Tan said Tengku Adnan also suggested that his bail amount to be increased from RM500,000 to RM1 million and was also prepared to report himself at the Malaysian Anti-Corruption Commission (MACC) office every month, if needed. “My client and his wife often visit their children in Australia . My client is also no longer working with the government and he had to handle his business overseas. He is also not a flight risk and has given his cooperation to MACC,” he added. Meanwhile, Tengku Adnan maintained his not guilty plea to accepting a bribe and an alternative charge with accepting a bribe of RM1 million allegedly for approval of an application by a company to raise development related ratio in Jalan Semarak, Kuala Lumpur in 2013 when the charges were read out to him again . He was charged with corruptly receiving for himself RM1 million from Tan Eng Boon via a Public Bank cheque belonging to Pekan Nenas Industries Sdn Bhd which had been deposited into a CIMB Bank account belonging to him. The deed was made as a reward for himself for approving an application by Nucleus Properties Sdn Bhd (now known as Paragon City Development Sdn Bhd) to raise the plot ratio pertaining to development at Lot 228, Jalan Semarak, here. He was charged under Section 16(a)(A) of the MACC Act with committing the offence at the Putra World Trade Centre branch of CIMB Bank Berhad, Jalan Tun Ismail here on Dec 27, 2013. He faced an imprisonment for up to 20 years and fined not less than five times the amount or value of the bribe which is the subject of the offence if the bribe could be valued or in monetary terms, or RM10,000 whichever is the higher, if found guilty. He also faced an alternative charge, in his capacity as Federal Territories Minister, to have received for himself RM1 million from Tan via a Public Bank cheque belonging to Pekan Nenas Industries Sdn Bhd which was deposited into his CIMB account, when he very well knew that Tan, as a director of Nucleus Properties Sdn Bhd had connection with his official duties. The court set Feb 28 for mention.